Have You Seen This Car For Sell Somewhere? Discussion in 'Exploring everything under the sun!!' started by BBQ_HotDogs, December 18, 2004. 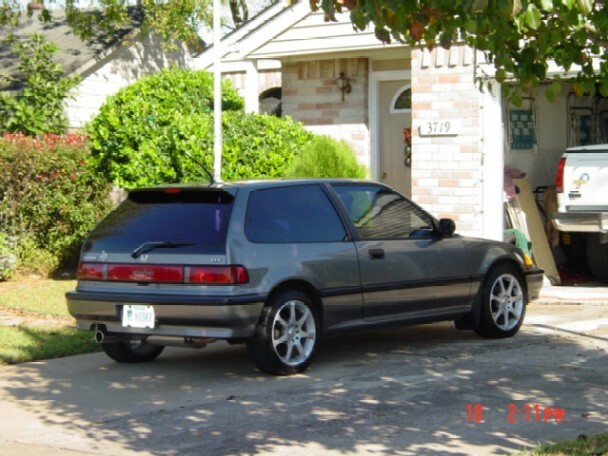 Just like the title says, I am looking for a Honda Civic Hatchback. Have you seen one like it in real good shape for sell somewhere? I need to get something quick until I get a settlement on my upside down Explorer and this car gets great gas mileage and can get me around doing my erronds. Also someone was bragging about theres and I want to see if I can get one just like his only better, LOL. I don't know the exact year, but I think it like a 96 - 98 model. Excellent Cars!! I had one for about 6 years. In '92, they changed bodies, and the hatchbacks were BFU IMHO. Rice Rocket = car with lots of stickers and coffee can muffler. Most likley a honda. Can be seen with large amounts of stickers, bad paint, cut springs, a spoiler taller then Shaq, large wheels and overall bad taste. Rice Boy = driver of above vehicle. A poser who thinks that leaning all the way back in his drivers seat makes him go faster. Now I see from the pic that it's a Honda with large wheels but I don't think it 100% qualifies without the stickers, bad paint, cut springs and taller than Shaq spoiler....lol. Just making sure you're not contemplating a move to the dark side. Are you? I am looking for a Honda Civic Hatchback. I don't know the exact year, but I think it like a 96 - 98 model. i have a 91 with the big 1.5 litter it gets 40-42 city, 38 highway only breaks 100mph with a 1/4 tank and a stiff tail wind. its at 105,000 miles with the only problem being CV started clicking took day and a half for the first side and 15 mins to do the second. sorry about your truck but if you find a good, clean, cheap honda jump on it. My friend just got rid of his 90 dx hatchback, the damn thing had 215k miles and still ran like a champ. Just find one that was always had the maintainence done on time, then it should be nice and reliable, remember "hondas don't break in till 100k miles". I'm not going to the dark side for sure. I need something cheap and reliable right now while I make a decision on my next move. I guess I should sell all of my XMODS and have more money for a car. I have 2 XMODS that if I could get better traction on the rear tires would probably do wheelies, LOL. I am still fighting with the insurance company over my Explorer right now. Nothing is happening to it, she is locked up in my garage nice and safe. But if anyone sees a car like this somewhere and it is real clean and for sell, can you give me a toot please? I need something to put around in to the golf course.